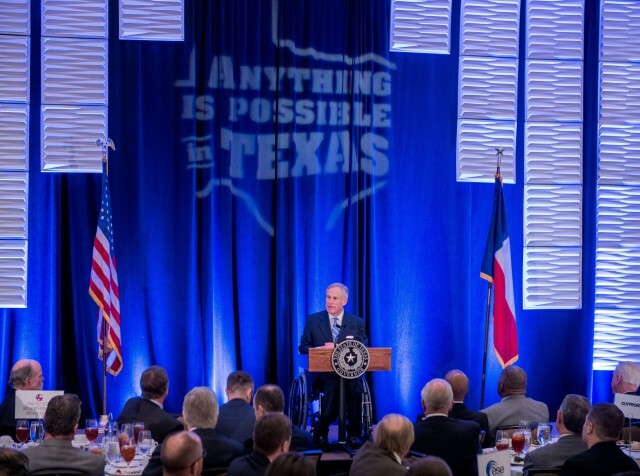 Governor Greg Abbott today delivered a State of the State address at the Houston Business Coalition and C Club Luncheon in Houston. The Governor spoke about his legislative priorities for the session, including the need for property tax and school finance reform, and discussed the state's continued commitment to recovery efforts for Texans impacted by Hurricane Harvey. "I’m proud of how this community and those across the impacted regions responded to Hurricane Harvey," said Governor Abbott. "From our first responders and emergency workers to community leaders and faith-based groups — Texans stepped up to help those in need. But there's more we must do to help Texas rebuild. By making disaster preparedness and response an emergency item this session, we are ensuring that the state will continue to invest in recovery efforts and support Texans who are still rebuilding their lives after this devastating storm." This is Governor Abbott's third and final stop on his State of the State tour throughout Texas. He previously visited the Richardson Chamber of Commerce and the North San Antonio Chamber of Commerce as part of his tour.